This is a sponsored post by a service we think is awesome! Please see the bottom of the article for a special promo code from UnboxBoardom, a board game subscription box. ‘Tis the season for gift giving, and board gamers can be hard to shop for. You see, board gaming is a very personal hobby. Speaking from experience, a gamer can be very picky about what they want, mainly because there is such a wide range of types of board games these days! We’re here to help you find something for that gamer on your list. We’ve broken down this guide for different types of games, including games for Children, Families, Couples, Singles, College Aged, Video Gamers, and Stocking Stuffers. And if you still can’t decide, you can give them the gift of choice! Check that option out at the bottom of the page. If you know a child that enjoys the idea of memory match, this game takes that idea and adds more game to it! The idea is, players must unite their forces to find the toys that will frighten the monsters and lock them into the closet. Players will work together to remember where certain toys are on a grid of tiles, and then flip over the toy that matches the one the current monster is scared of. If a player can do that, the monster is scared away! The goal is to scare away all the monsters. We’ve played this with our four-year-old, and she has a blast with it. You can adjust the difficulty and add optional rules to change things up. To learn more about Monster Chase, head here. Hamster clan is a great introduction to the concept of cooperative games. In this game, players work together instead of against each other. They win or lose as a team. First of all, you’ll notice several games by Haba on this list. We highly recommend them as a company that makes excellent kids’ games. Let’s talk about the game. Players are Hamsters trying to collect carrots, grain, and clover to store up for the winter before it arrives. The amount you need to store is dependent on player count. If you can work together to collect and deliver to the right rooms on the board, you win! What is unique about this board is that it has actual moving parts. There’s an elevator, a wheel, a mine cart, and a swinging cage that hamsters will use to move from room to room. There’s a high interactivity factor with this one! If this sounds like the right gift for your tiny gamer, head here. In Animal Upon Animal, players are attempting to stack animals on top of each other. Each turn, a player will roll the die and that will inform whether they need to stack 1 animal, 2 animals, or even force an opponent to stack an animal! The winner is the player who can stack all of their animals on top of their alligator first. This is a great game to develop dexterity and hand/eye coordination. It’s also a blast to play as a parent! Plus, the wooden component quality is top notch! If this sounds like the right gift for your animal loving child, head here. Haba Games does a great job of making games that aren’t your traditional “roll and move” game and Rabbit Rally is no exception. Your rabbit is trying to get from one side of the river to the other where the golden carrot awaits. In order to do that, players will lay wooden planks across stones in the water to make bridges. However, the job isn’t as easy as it seems. Players will have to guess from a selection of different sized planks which one is the right size to bridge the gap from one stone to another. It’s a game that truly encourages spacial thinking. It also includes adorable wooden rabbit figures, and again, high quality wooden components. To learn more about Rabbit Rally and to see a how-to-play video, head here. If your little gamer likes to race cars around a track, then check out Monza! In Monza, six racing cars are standing on the starting grid, of the 3 lane racing board. But only the player who gets the right colors with the dice and makes clever combinations will be able to move rapidly ahead. While this game does include dice, it’s not a traditional “roll and move” game. There is some strategic thinking here with regards to how to utilize the different combinations of the colors in order to move ahead of their opponents. Celestia is a blast. If you like to press your luck or know a family that does, this would be a good option. Players are trying to collect the most treasure points. To do that, they take turns as the captain of a floating ship the flies from island to island where they will find treasure. However, as they progress to the next island, hazards will present themselves, and if the captain can’t deal with them, the ship crashes and all the treasure you have collected up to this point must be discarded. You have to make the choice of whether to stay in the ship or get out and save your treasure before journeying on to the next island. Celestia has provided us with many fun experiences and we highly recommend it. Taking the stacking games to the next level, we recommend Rhino Hero! In this game, players have a hand of cards that are either walls or roofs. The goal is to empty their hand of cards first! They do that by stacking wall cards on top of roof cards, and roof cards on top of wall cards. But the room cards tell you how many call cards have to go on them, so it’s not as easy as it sounds! For a high energy game for a wide range of ages, we recommend Rhino Hero. Thanks to the magic of Harry Potter, magic and spell crafting has become very popular. And if you have kids that are into that sort of thing, Arcane Academy is a great option. Players are students at a school for magic, trying to complete their assignments first and gain the most points for doing so. Students need to craft items or cast spells using a variety of different resources. This game has a unique tile linking mechanism that gives you a very satisfying feeling when you can make some awesome combos. You can see our full review on this game. For the family that enjoys Harry Potter and neat artwork, check out Arcane Academy. Azul isn’t a very thematic game, but the gameplay makes up for that! Essentially you are trying to build a wall of colored tiles. Players will select available tiles and place them onto their wall in the right combinations in order to maximize their points. The game is simple, but also offers some very strategic decisions. You can watch our full review to see our thoughts. For a laid back, beautiful game, we recommend Azul. You may have seen this game in Target. They’ve had it available for years, for good reason. This is called a card drafting game. Players pass cards around the table, keeping ones they want, and passing on ones they don’t. You are trying to build a civilization using these cards, including Wonders. There’s a really cool set collection aspect to this game too, where if you collect the right sets of cards, you can really maximize your points. For an easy to learn modern staple, we recommend 7 Wonders. In Raptor, one player plays a group of scientists trying to capture baby raptors for, ahem, research. The other player plays the momma raptor trying to protect her babies from the evil scientists. What’s great about this game is that we enjoy playing both roles. It’s fun to switch back and forth and your objectives feel very different when you do switch. It’s a relatively quick game, at about 30 minutes or so, making it tempting to play back to back games. For a couple who is into dinosaurs, or just likes going head to head without being to mean to each other, we recommend Raptor. Brand new this year is Fog of Love. This is truly unlike anything we’ve played before. Each player takes on a character with different trait goals, features, and career. You’ll play through a love story, making decisions in different scenes that will raise or lower the aspects of your various traits in order to meet your trait goals at the end of the game. There is an element of role playing in this game, and it really shines if you go all in. To see more of our thoughts, check out our review. For a truly unique experience that doesn’t even feel like a board game, we recommend Fog of Love. It is available as a Walmart exclusive. Seikatsu is probably the easiest game to learn on this list. You simply draw a tile, and place it down on the board adjacent to a previously placed tile. You score points if you place it adjacent to a bird of the same color, and then at the end of the game you score points for flowers of the same color in each row. However, for end game scoring, each player will score based on their perspective on the board. So while you are trying to place tiles of the same flowers in your row, your opponent may mess you up based on their own objectives. It’s easy, quick, and a great one to play with just 2. For its ease of play and beautiful production, we recommend Seikatsu. A little game called Codenames took the gaming world by storm a few years ago, and now a two player version has been released. In Duet, players will give one-word clues to try to get someone to identify their agents (words) among those on the table — but now they’re working together as a team to find all of your agents. It’s a great exercise in teamwork, vocabulary, and creative thinking. For a team-building experience and people who love word games, we recommend Codenames Duet. In Friday, the player controls Friday, trying to help Robinson Crusoe survive the hardships of the island and defeat pirates. It’s a solo deck-building game in which the player must optimize their deck of cards in order to respond to the hazards of the island and pirate ships. This is a really fun solo experience and for that, we recommend Friday! In Onirim, the player is a Dreamwalker lost in a dream, trying to find doors in order to escape before time runs out! The player must work against the game in order to gather eight door cards by the time the deck of cards runs out. The trick is, you must decide the best way to use the cards in your hand in order to obtain the door cards. For difficult decisions and a unique theme, we recommend Onirim. In this beautiful tile-laying game, the player is trying to tell a story by laying down tiles of certain colors and numbers in columns. The trick to this is, you have a limited amount of tiles in your hand, and you are trying to lay them down to make the largest group of tiles of the same color touch. You also want to have the numbers grow as the tableau grows to the right! Confused? It’s a little hard to explain in writing. Check out our review for a visual explanation. 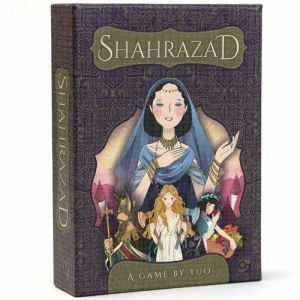 The cool thing about Shahrazad is that if you do want to play with another person, you can! It works great as a solo game, or with another person. For its beautiful artwork and tricky decisions, we recommend Shahrazad. Someone has been murdered! In this game, one player is the hidden murderer and will select a weapon and evidence from the scene of the crime. This is only seen by the Forensic Investigator. The Forensic Investigator must then use clues to help their team members figure out the murder weapon and evidence while the murderer is trying to throw everyone off the trail. This game plays up to 12 players and is super simple to understand. It’s quick and everyone will have a blast. For a fun, deceptive time, we recommend Deception: Murder in Hong Kong. Imagine the game of telephone – sketched out! That’s the premise of Telestrations. Everyone gets a secret word and a dry erase book. They will draw their interpretation of the word on the sketch pad and then pass it to the next player who then has to try to guess what the previous player drew and writes that word down. Following this, the pads are passed and the process repeats. This continues until the sketchpads get back to their original owners. The best part is flipping through the drawings and laughing at the atrocious artwork. For many laugh-out-loud moments, we recommend Telestrations. Ever been in a moment when you feel like you’re the only one not in on the joke? That’s kind of what’s happening in Spyfall. At the beginning of the game, players are randomly dealt cards with the exact same location on it… except for one person. That person will have randomly received a “Spy” card. Players will go around the table asking each other questions about the location. The spy’s goal is to try to figure out where everyone is based on the questions and answers given, while the other players are trying to figure out who the spy is. It’s pretty nerve-wracking to be the spy, but a lot of fun trying to weed the spy out. For a game that really tests your ability to lie, we recommend Spyfall. Sometimes you just want to roll some dice. That’s pretty much all you are doing in Bang! The Dice Game. Players are dealt different roles with different objectives. If you are the sheriff, you want to eliminate the outlaws. If you are the deputy, you want to protect the sheriff. If you are an outlaw, you want to eliminate the sheriff, and if you are the renegade, you want to eliminate everyone! The game plays up to 8 people and can get pretty chaotic with its full compliment of players. It’s also pretty simple. It uses a basic Yahtzee style mechanism, so pretty much anyone should be able to catch on. For a good time in the wild wild west, we recommend Bang! The Dice Game. This could be described as Halo: The Board Game. You play a character running around an arena trying to shoot your opponent! There are really cool high-tech weapons, and it’s a blast seeing what kind of mayhem unfolds in this game. If you know someone who loves first-person shooter video games, this is a perfect match, as it feels just like that! For a first-person shooter experience on your table, we recommend Adrenaline. One of the most popular styles of mobile video games is the “match 3” like in Candy Crush. Potion Explosion gives you the same feel. There’s a cool marble dispenser and those marbles represent ingredients you need to craft potions. When you remove a marble from the dispenser, all the marbles behind it roll down. If you match two colors, you create an explosion and get to remove those from the dispenser. And if you make another explosion, you can continue removing marbles. Chain reactions are really cool! Not only that, but the potions have really neat effects once you are done creating them. For those who love Candy-Crushing on their phone, we recommend Potion Explosion. What if Mario Kart was a board game? Well, then you’d have Rush and Bash! In this game, you race around a track trying to avoid obstacles. But you can shoot your opponents and drop more obstacles for them to avoid. It’s pretty simple, but really captures the chaos of Mario Kart. For those looking to relive their glory days as the Mario Kart Champion, we recommend Rush and Bash. Finally, we’re going old school for Flip Ships. This is a cooperative dexterity game where you are trying to defeat waves of alien ships coming down into the Earth’s atmosphere. You do this by flipping your ship, kind of like flipping a coin, onto those enemy ships. Those rows of undefeated ships will march forward like they do in Space Invaders. If you like the feel of that game, you will see many similarities in this one. For a trip back to the 80’s arcade style games, we recommend Flip Ships. Love Letter is a game of only a few cards and comes in a small drawstring bag. It’s a game of risk, deduction and luck and there really is a theme for everyone. We talked about card drafting and set collection with 7 Wonders in the family games section. So how about a game that offers the same type of experience but with adorable little sushi artwork? Sushi Go is “The Pick and Pass Card Game” where you are trying to collect sets of sushi! You’ll have to decide which sushi to keep and which to pass on to maximize the points you score. For a game that’s as monumental as 7 Wonders, but fits in a stocking, we recommend Sushi Go. Now you’ll need a pretty big stocking to fit this one in, but if you can, it’s worth it. It’s pretty much just cards, so again, easily portable. It’s also really hard, so you’ll want to play again and again to try to beat it. You can see our full review of The Grizzled to get our full thoughts. For a difficult and portable cooperative game, we recommend The Grizzled. Finally, if you still aren’t confident in your choice to give that gamer in your life, or you want to add something that will bring them joy for months to come, why don’t you let THEM choose!? If you gift UnboxBoardom, a board game subscription box, the recipient of this subscription will be able to choose from a selection of three popular board games to add to their collection each month. After they make a selection, the box will be shipped to their house to keep! It will feel like Christmas every month! Additionally, you can select how often you want your gamer to receive games too – monthly, bi-monthly, or quarterly. And in the spirit of giving, for every 10 new subscribers that signup, UnboxBoardom will donate a board game to an organization that helps kids who can’t afford their own. This holiday season, there is also a less expensive one-time gift option called a Stocking Stuffer Surprise! Don’t forget to enter the promo code MARRIED17 at checkout for $10 off your first box! We just released our gift guide, too, and there are only 2 games that are on both our list and yours (Potion Explosion and Sushi Go). I think it shows the breadth of what’s out there – there’s a game for everybody!